A plague of locusts descended Saturday on agricultural farms in Giza and on Cairo. 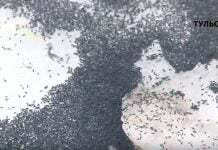 Egyptian Agricultural Minister Salah Abad Almoman said the swarm is comprised of an estimated 30 million insects and was causing great damage. In Cairo, residents burned tires to create a black fog to keep the locusts from settling in the city. 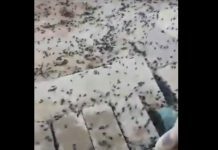 Swarms were also reported to have reached Egypt’s Red Sea city of Zafarana, some 200 kilometers (124 miles) from Cairo, and then the Upper Egyptian city of Qena where locusts appeared in at least three major villages. The locust swarms are set to creep across the middle east to Israel, Jordan and Lebanon. In 2004, Egypt witnessed one of the most serious locust infestations in recent history, when farmers in 15 out of the country’s 27 governorates suffered extensive crop damage. 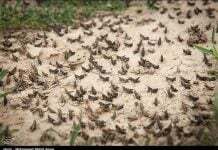 The Egyptian Ministry of Agriculture issued a statement saying it had set up task forces to deal with the locust plague.